A wide variety of accommodations are available in Tofino ranging from luxury hotels to ocean side campgrounds. Numerous vacation rentals and moderately priced motels are excellent options for anglers wanting to optimize the vacation. 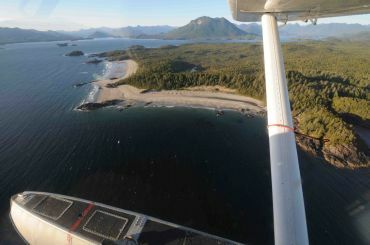 It is important to book early for July and August as Tofino can get quite busy in the summer. Early spring is a good time to find fantastic deals on comfortable accommodation. Here are a few noteworthy accommodations our guests have been pleased with in the past. Many other great choices are available and can be found online. 1.800.333.4604 / 250.725.3100 - World renown for exemplary service, a stunning location, and an in-house Spa. Dwell Tofino Vacation Homes - Meticulously cared for vacation rental properties. 1.877.844.7873 - Luxury ocean front accommodation with a fantastic view from the restaurant. 1.800.565.2322 - Modern west coast style on beautiful Cox Bay. 1.866.725.3755 - One and two bedroom Ocean front cabins on MacKenzie Beach. 250.725.4213 - Immaculately maintained grounds, cabins and RV sites. 250.725.2900 - Great views, rustic cabins. Clean, simple and central. Walking distance to restaurants, shops, galleries, and the dock.